In my previous post, I detailed my plan to start screencasting as a way of getting better at presenting. In this post I’ll talk about some of the questions and challenges I’m dealing with. These challenges revolve around setting up my recording equipment and environment. Here is my original set-up. I’ve recorded myself before with a portable Samson Go Mic and a cheap headset mic. This was my first foray with the Blue Yeti. I’m not an audio engineer, so I’m mainly going by what I think sounds good (or at least passable). I tried recording a Storyline 2 demo in Camtasia and ran into a few snags. The video recording was lagging a bit. I figured maybe this was something to do with my memory/processor? Maybe having Storyline 2 open and recording with Camtasia was too much? I increased the memory on my virtual machine. The audio sounded great through the headphones while recording, but playback was a different story. It had random bits of static throughout as well as places where it sounded like I stopped recording for half a second. My voice went in and out. I tried multiple recordings and got the same result. I then tried adjusting things with the Blue Yeti mic, including gain, proximity to computer, padding on desk, etc., all to no avail. Next, I tried recording using Articulate Replay. Same result. I tried recording with the inline recorder in Storyline 2. Same result. Still static. I tried the Samson Go Mic and the headset mic. Same results. Frustration started to set in. I jumped online and looked for similar problems with this microphone and recording in general. I can’t tell you how many rabbit holes that led me down. Here are some of the suggested causes: the mic is too close to the computer, the mic needs to be in a sound enclosure, the cord from my USB mouse is interfering with the microphone cord, various settings on my Mac are off, it’s a problem with Camtasia, the length of the microphone cord to the computer is too long, etc., etc., etc. Ugh. I tried several of these things. I unplugged my USB mouse and used a wireless mouse. Same result. I did try holding the mic in my hand and backed away from the computer as far as the cord would reach. This did help, but how am I supposed to do a screen recording when I am 3 feet away from my desk? 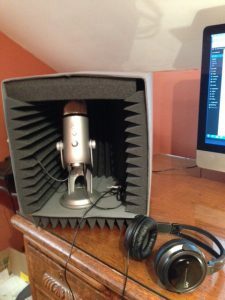 So, next I decided to build a DIY portable sound booth for my mic. Here is a pic of my fancy sound booth. Then I realized after trying all of these options that I hadn’t tried recording directly into Audacity. Again, remember, I am not an audio engineer. I’ve used Audacity, but only used Normalize or Noise Removal. Well, I tried recording to Audacity and it was like night and day. It was flawless (well, okay, flawless compared to the previous 50 recordings laced with static). So what does that mean? I don’t think the mic is the problem. Is the static coming from using the audio recorders within Camtasia, Replay, or Storyline 2? Is the mic still too close to the computer. This Mac Pro is a beast and has a noticeable hum. New plan. Since I can’t get the internal audio recorders in any of the programs to work without sounding full of static, I decide to record my voiceover audio in Audacity at the same time I record the video screencast in Replay. I’ll then export the audio as a .wav file and import it into Replay. Not ideal, but seems to be the only working presently. First successful recording (see below). I’d love to hear your thoughts on how I did and the sound quality. Or any suggestions for any of the issues I ran into. I’m going to keep experimenting to try to get a cleaner end product. I’m also going to try to objectively critique myself on the points I mentioned in my first post. I’ll talk about that in another post.